Brampton (/[unsupported input]ˈbræmptən/ or /ˈbræmtən/) is the third-lairgest ceety in the Greater Toronto Area (GTA) o Ontario, Canadae an the seat o Peel Region. 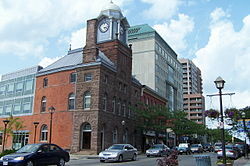 As o the 2011 census, Brampton's population wis 523,911, making it the nint lairgest ceety in Canadae. Wi the median age at 33.7, it is the youngest commonty in the GTA. Brampton haes the lairgest concentration o Sooth Asies in Canadae, makkin up 31.7% o Brampton's population. Brampton wis incorporatit as a veelage in 1853, takkin its name frae the rural toun o Brampton, in Cumbria, Ingland. Brampton wis ance kent as The Flouer Toun o Canadae, a title it earned due tae the ceety's lairge greenhoose industry. This included Dale's Flowers, a company that wan mony internaitional rose awairds for nearly hauf a century. The day, the ceety's major economic sectors include advancit manufacturin, retail admeenistration an logistics, information an communication technologies, fuid an beverage, life sciences an business services. Wikimedia Commons haes media relatit tae Brampton.